Have a green Festive Season this year by substituting the boring old gifts like soaps and socks, with plants and gardening products that will add lasting value to the lives of loved ones. Mandevilla ‘Cosmos White’ is a lovely climber which has super big white flowers with a yellow throat. It blooms non-stop and is perfect for mom’s garden, growing over a trellis or an arch, but also stunning on patios and balconies in a pot. 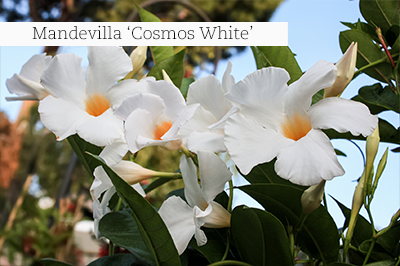 This mandevilla requires little water and prefers a location with full sun or partial shade. To turn the garden’s organic waste like leaves, grass clippings, and prunings into compost, dad needs a smart compost bin and handy compost activator to speed up things. To recycle all food waste safely and to improve the quality of the garden soil even more, he will also need a bokashi composter and a packet of bokashi bran or liquid bokashi. Gran will love some colourful Coleus hybrids to turn her shady garden’s floor into a tapestry of leaf colour. Coleus plants are regarded as summer annuals since they do not take kindly to cold and frost. They are available in the flashiest leaf colours and are super simple to grow. Plant them in compost enriched soil in light shade, and do not overwater. 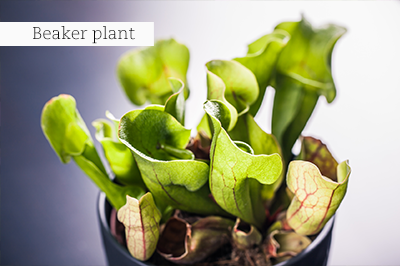 Boys love the macabre, like plants which are carnivorous, so beaker plants (Sarracenia), which attract and “catch” insects will be a super choice. They must be kept in a sunny and warm spot in pots containing real peat. The pots must always stand in at least 2cm deep water as the plants like to be wet all the time. Repot them every year into fresh peat and never ever fertilise them as it can kill them. Spoil her with a small ficus tree to keep in her bedroom. Ficus trees are very forgiving if one perhaps forgets to water them now and again, and it’s not difficult to keep them happy, as long as there is ample indirect light, they are not moved unnecessarily, or standing in a draught. A really smart choice for a discerning teenager, is the pseudo bonsai called Ficus ‘Ginseng’. Decorate the house with the traditional plants we all love over the festive season. 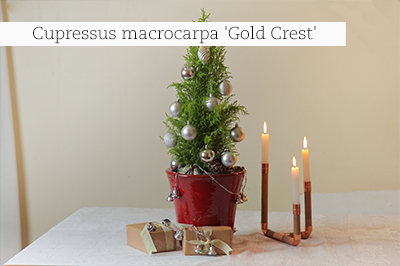 Use a lovely cypress like Cupressus macrocarpa ‘Gold Crest’, with its lime-green feathery foliage as a cute festive tree, and deck the halls with lots of Poinsettias with their festive bright red flower bracts. Display them in bright indirect light and be careful not to overwater them. You can also use them as table decorations, by displaying them in a row of white or black ceramic pots. Hot tip: All of the above is a one-stop-shop-experience waiting for you at your nearest GCA garden centre! Special things and thoughtful touches…. Tie bunches of fresh herbs like sage, rosemary, lavender and bay leaves together with string to decorate the festive lunch table. Gather mixed flowers from your garden and tuck them into everyday objects like glass bottles in a variety of shapes and sizes. Group them on a window sill for maximum impact. Fill your house with Hydrangea flowers. Pick mature flowers (all the little florets must be open), scrape the bark off the bottom 5cm of the stem and leave them overnight up to their necks in cold water before arranging them in vases. Use rosemary branches and ribbon to make a pretty festive wreath for your front door. You can also use aromatic rosemary stems to make a centrepiece for your festive table. Simply buy an oasis ring, stick the rosemary stems in, and fill up with small cocktail tomatoes on toothpicks. Enjoy the sweet taste of strawberries and watermelon with refreshing ice lollies packed with flavour. Blend 4 cups of watermelon cubes with 2 cups of home-grown hulled strawberries until smooth. Fill popsicle moulds with the mixture and freeze for at least 4 hours. De-mould and enjoy! 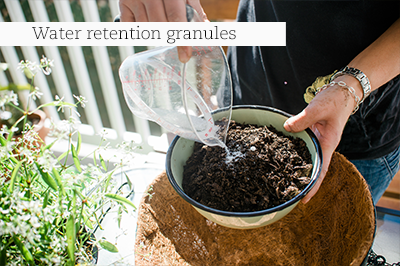 Don’t forget to add water retention granules to the soil in all your outdoor pots. It can go a long way to save precious plants. After watering thoroughly, top up every pot with fresh compost to help keep the soil moist and cool. Water all indoor plants and place them on an old blanket which has been wetted down well in the bath. Leave curtains or blinds open to allow for the most light. Check that your irrigation system is in good working order and clean blocked sprayers. Mulch around each rose bush to keep the soil cool and moist as long as possible. Spray against blackspot, insects, and red spider mite before leaving. Pinch out the growing tips of young branches and remove all buds. This will reduce the plant’s water needs and will delay flowering until your return. Move roses in containers into the shade and place saucers beneath the pots to catch water. Organise for container roses to be watered every second or third day, or attach them to an automatic irrigation system. Symptoms of ant infestation include small heaps of fine sand on the surface above the nests on lawns, uneven or dying patches of lawn and sometimes uneven paving. 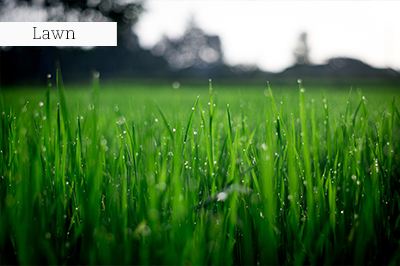 Ants prefer lawns which are patchy and in a bad condition, so first prize is to ensure your lawn is well-maintained. Spray with a contact insecticide or apply granular ant bait, which will be carried to the nest, and the nest eradicated. These are easy on your water bill! Our choice of water wise plants for December can actually be planted together as a tough combo; use Euphorbia milii as a background row. Fill in with Helichrysum petiolare and finish off with a border of Euphorbia hypericifolia ‘Diamond Frost’ – a combination for a sunny and hot spot which will give you pleasure for years to come! Crown of Thorns (E. Milli) is a shrub which has prickly stems and bright green leaves. Bright red bracts surrounding tiny flowers are produced throughout the year, meaning that you will always have a splash of colour in your garden. You will also find them in yellow or pink. Crown of Thorns is an excellent barrier plant and is very pretty when planted en-masse. 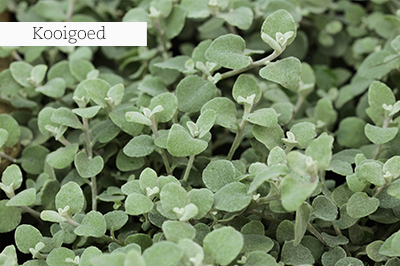 Kooigoed (H. Petiolare) is a shrubby plant with woolly, grey leaves and a cascading habit. This makes for a beautiful filler plant, as it lends an element of softness. It bears small, cream-coloured flowers in late summer to autumn. ‘Diamond Frost’ (E. hypericifolia) is a tough groundcover that covers itself in masses of small white flowers all year long. It creates lovely soft and flowery pillows on the foreground of mixed beds. 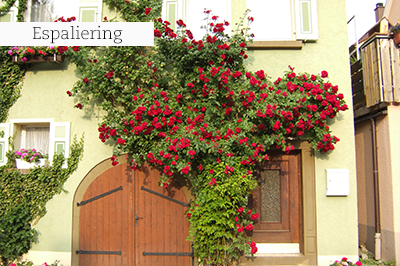 Espalier rambling roses, feed, and water well. Stake dahlias as they grow and keep on disbudding them by removing the side buds to encourage large flowers. Cut back Chrysanthemums to ensure bushier growth and lots of flowering stems in autumn. Mulch and water well afterwards. Whitefly infestations could be a problem on Fuchsias. Spray twice weekly for a month, with a canola or neem oil based remedy – enquire at your local GCA Garden Centre for the best product. Clean out all ponds and water features. Water lilies and other water plants should be at their best now and are readily available, so invest in some new floating greenery and flowers. Keep a look-out for powdery mildew on cucumbers, squash and pumpkins. Give citrus trees their mid-season feed of granular fertiliser and water well. Planting seed potatoes in December and January will produce a harvest in April and May, and they can be for stored for eating during winter. Weed the garden. After weeding, place a layer of organic mulch over every last inch of soil. Mulching not only saves water and time when you’re desperately busy with other tasks, but will also provide a professional and well cared for look, and will display existing plants to their best advantage. Add swathes of Gaura, Angelonia, Cuphea, lavender, Plectranthus ‘Mona Lavender’, Bacopa, perennial verbena and pentas – none of these needs excessive pampering or watering! Paint peeling and sad looking loungers, garden furniture, the garden shed, picket fences and pots in a new colour. Make new slipcovers for scatter cushions (botanical prints are still trending!) or splurge on some brand new soft furnishings for your garden. Clean your braai and pack a stack of wood neatly underneath it (even if you’re doing gas or kettle braai cooking). There is no better way to create atmosphere than with a crackling fire.